Weleda Vegan Citrus Deodorant Roll-On with its refreshing and zesty citrus essential oils eliminates unpleasant body odors. Lemon peel oil has invigorating properties and also serves as a purifying disinfectant. Free of aluminum salts, your body’s natural detoxification process is supported while bacteria that cause unpleasant odors are neutralized. With Weleda Vegan 24h Deo Roll On, you’re left smelling fresh and feeling the citrus-induced invigoration of organic lemon peel oil ! Ce déodorant est une bonne alternative aux déodorants chimiques, il tient bien et élimine les éventuelles odeurs par un parfum rafraîchissant et citronné ! Take a daily fresh feeling of WELEDA Citrus Deodorant Roll On ! 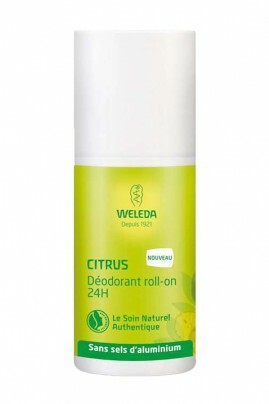 Apply Weleda Citrus Deodorant Roll On as often as needed throughout the day.